For contractors who want to ensure they haven't double or triple booked their best subcontractors, try the new "conflicts" reporting in BuildIT. 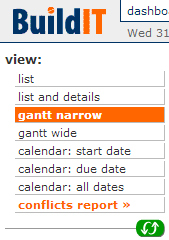 We also have a preferences area where you can set your defaults, and have the conflicts report tailored to your needs. Besides "trade conflicts", this also works for customers that have several crews or employees. You can see where the overlaps are, and where the gaps are in the schedule that can be filled. In doing so, you can optimize your staff, and increase your billable hours per month. Graphically, you can see on the BuildIT Gantt chart across several jobs where you have gaps, and where tasks overlap. Make your edits, then re-run the "conflicts report" to ensure you have a schedule that is buttoned up. You'll be better scheduled, and your trades will thank you.